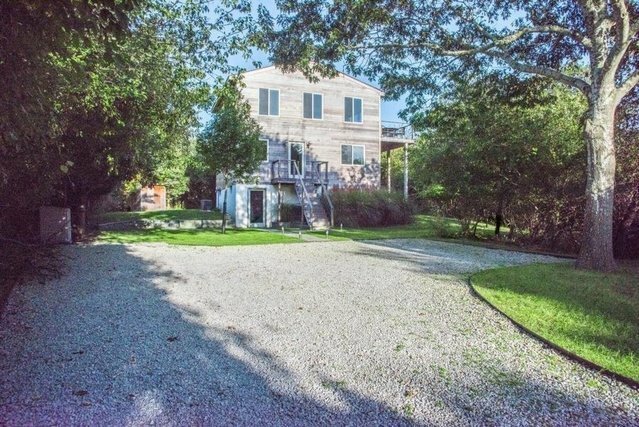 Rental Registration #: 18-889 Entirely renovated inside and out, and minutes to the ocean shore, this private Montauk retreat is turnkey, offering four bedrooms and two full bathrooms. With three levels of living space, the top floor features a sparkling new kitchen with stainless steel appliances, dining area, living room, one bedroom, and a full bathroom. This level also has a spacious deck for dining and lounging in the sun. Three bedrooms, full bathroom, and open den are all featured on the middle level, while the walk-out lower level has additional living space all filled with natural light. The half acre property is manicured, professionally landscaped, and borders a reserve for ultimate privacy. Quiet and convenient, yet moments to the beach and Town amenities. Updated for 2019. Folio#: 44036..